Our twelve-hour flight from London was approaching northern Brazil. As I looked out the airplane window I saw a bright orange glow on the horizon, and I could just barely make out the lush green rainforest eleven thousand meters below, in a blanket of early-morning mist. "It's exactly like I remember it from 1988," I thought. Many things have changed in the twenty-three years since my first visit to Brazil. For one, I am older now. Back then I was in the prime of life with enough exuberance, daring, and enthusiasm to pioneer Krsna consciousness in the Amazon jungle. "I'm not sure I'd do that again," I thought with a chuckle, recalling my brushes with piranhas, quicksand, dysentery, and almost death. And Brazil had changed too. Then a struggling economy, it was now becoming a global powerhouse. While I'm enthusiastic, youthful and strong." Although no longer youthful and strong, I remain as enthusiastic to continue spreading Krsna consciousness as when I first came to Brazil. After the success of our traveling festival last year, I was returning with a party of twenty-five talented devotees for a seven-week tour to spread the nectar of the holy names all over the country. The long flight finally set down in Sao Paulo. After immigration and customs, I was surprised by a large gathering of devotee children and teachers who greeted me with an enthusiastic kirtana. "Welcome back to Brazil," said Vaikuntha-murti Das. "These children are from the Bhakti School, our government-registered day school just outside of Sao Paulo." "There must be several devotee families in the area," I said. "How many children are here?" "Fifty-six," said Vaikuntha-murti, "but none of their parents are devotees. In fact, most of their fathers are in jail." "A favela is like a slum," he said, "but very poor and with a lot of crime. The favela in Franco da Rocha is one of the most violent in Brazil. We started a small temple there some years ago, where the local children would come after school each day and on weekends. Eventually, many of them started practicing Krsna consciousness, so we decided to open a gurukula. "We've had several incidents recently that show how grateful the local people are for the school. Last month a thief stole a lamp from a classroom, and the headmaster found it for sale in a pawnshop. When he told the shop owner the lamp was from the Hare Krsna school, the owner called for the thief, who happened to be nearby, and severely scolded him. He told him he would never accept anything that was stolen from devotees. "He gave the lamp back and made the thief apologize on his knees. And some months ago the wife of the local drug lord put their ten-year-old daughter in the school. She wears a sari to classes, chants on japa beads, and is strictly vegetarian. Her mother attends the monthly parent-teacher meetings." Vaikunatha-murti looked lovingly at the children who were chanting and dancing. "All these children are exemplary devotees," he said. 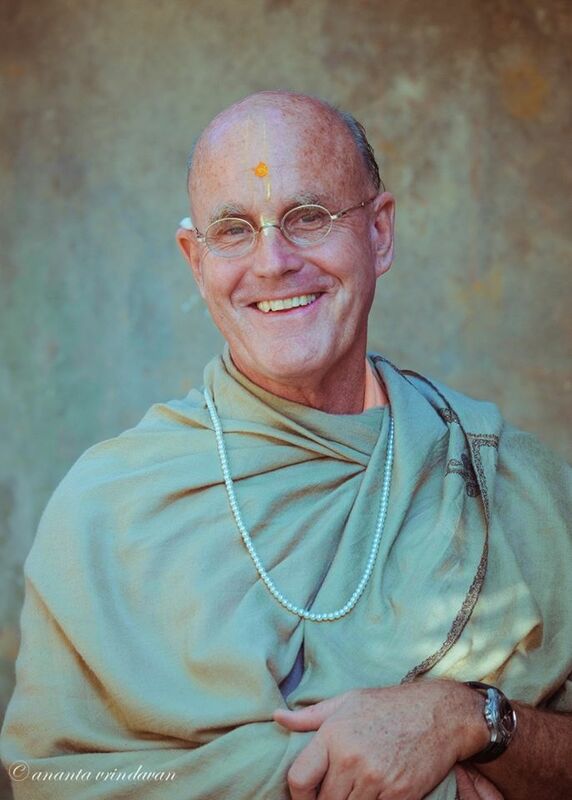 "They are serious about their studies and about their Krsna consciousness." "It's amazing, given that they come from such difficult backgrounds," I said. "They know real suffering," said Vaikuntha-murti, "so they're grateful for the happiness they're finding in Krsna consciousness. They don't take it lightly." The children escorted me to the car, chanting all the way, and I was driven to the apartment where I would be staying. I was exhausted from the journey, but I had a sleepless night because of jetlag. In the morning I managed to join the devotees, who had come from all corners of the world. We gathered for a briefing by Jayatam das and Nandini dasi. They had organized every aspect of the festival, even the transportation and the accommodation in the many towns where we'd be performing. Later that morning I asked Bhakta John, a local devotee, to take me to a park where I could chant my rounds. "If I don't chant, I'll just sleep," I said. "And I'd like to chant in a peaceful, quiet place with greenery. I've been on the road for many months. A place in the mode of goodness would do me good." "We could go outside the city," Bhakta John said, "but it would take hours because of Sao Paulo's congested traffic. Instead, we can walk to a little rainforest downtown." "There's a rainforest in the middle of the city?" I asked. "Yes," he said, "right in the middle of town. It's probably the most expensive piece of land in the city. The founders set it aside as a place where the people could find peace and quiet from the hustle and bustle of city life. It has remained as it is for centuries. You can catch a glimpse of what Brazil used to look like before it was developed." "I'd love to see it," I said. As we started walking, I pulled out my iPhone to make a call. "Be careful, Maharaja," said Bhakta John. "Here in Brazil there are a lot of poor, desperate people who would steal that phone given half a chance. Actually, though, if a thief ever demands something from you, just say you're a Hare Krsna, and he'll go away. It's worked many times." "Yes," said Bhakta John. "The poor people appreciate devotees for their harinamas and prasada distribution. Because of that, thieves don't usually steal from devotees." A hundred meters down the road we passed a shopping mall. "Let's go in and look around," I said. "Do you need something?" said Bhakta John. "No," I said, "but I enjoy meeting the people when I'm in a foreign country. I like to walk around the streets and talk to people. It's a good way to understand the country and how best to present Krsna consciousness." As soon as we entered the mall, a group of teenagers came up to us. "Hey," a boy said, "can we have our photo taken with you?" They surrounded me while one of their friends took photo after photo. "People respect devotees in Brazil," said Bhakta John. "We have a good image, and even if they don't know anything about us they are always curious." A shoeshine man smiled at us and said something to his friends. They nodded their heads in a gesture of respect. "What did he say to them?" I asked Bhakta John. "He said, 'There is a man of purity,' and he told his friends that purity is a man's most important quality." I turned around and went back to the shoeshine man. "Thank you for the comment," I said, "but I'm not pure." "But you lead a pure life," the man said smiling. "That's obvious by your dress and demeanor." "I try to lead a pure life," I said. "And that makes you purer than us," he said. His friends nodded in agreement. "Thank you," I said. "I will try to live up to your words." "Is there anything we can do for you?" the man asked. I was touched. "Yes," I said. "Please pray for me." Bhakta John and I got on the escalator going downstairs. "From that incident alone," I told Bhakta John, "I can see that in general people here are pious." On the floor downstairs, a young woman was selling jewelry at a small booth. "Sir," she called out to me, "may I speak with you?" I walked over to her. "Yes?" I said. "Can you give a name for my baby?" she said. I looked around for the child. "Where is the baby?" I said. She blushed. "Still in my womb," she said. "Is she serious?" I asked Bhakta John. "It appears so," he said. "I'm a complete stranger," I said. "Why do you want me to name your unborn child?" "Because you are a man of God," she said. "If you name him, he will be blessed." I felt undeserving of the remark, but I didn't want to disappoint her. "Let me think for a moment," I said. "Is your baby a boy or a girl?" "He's a boy," she said. "Oh, here comes my husband." “Alerto!" she called out. "This monk is going to name our baby!" "Wonderful!" said Alberto. They both stood watching me with expectation in their eyes. "We'll call him Rama das," I said finally. "That's so beautiful," the woman said. "What does it mean?" "Rama is a name for God in the Vedic scriptures of India," I said. "He appeared in this world to protect the pious and establish religious principles." "That's a great name," said Alberto. "'Das' means servant," I said, "so 'Rama Das' means the servant of God." "We can't thank you enough," said the woman. I wrote the name on a piece of paper and gave it to her. "Wow!" I said to Bhakta John as we walked away, "I've never seen anything like that before." Bhakta John smiled. "I think you will find many surprises in Brazil," he said. “Really?" I said. "Maybe even Ravana's treasure-trove of gold?" "What treasure-trove?" said Bhakta John. "In the fourth canto of Srimad-Bhagavatam," I said, "Srila Prabhupada writes that Ravana was a great devotee of Lord Siva. As a result he got the blessings of Durga and his kingdom in Lanka was built of gold. Srila Prabhupada said that historical references in the Puranas suggest that Brazil was part of Ravana's kingdom and he had huge quantities of gold taken from here through a tunnel to Lanka." "How could we go about finding what's left of that treasure-trove of gold?" said Bhakta John with an elfish grin. "I haven't got a clue," I said. "But Srila Prabhupada gave a more important treasure to Brazil: the chanting of the holy names of Krsna." As we left the mall a man in his early thirties came up to us. "Good afternoon, gentlemen," he said. "Very happy to meet you." He pointed to a badge he was wearing: "Save the Children." "We're working with the Brazilian government," he said, "collecting donations to put poor children in school." "Wonderful," I said. "Our organization has a school with fifty-six poor children near Sao Paulo." "In the favela in Franco da Rocha," I said. His eyes opened wide. "Franco da Rocha!" He exclaimed. "That's one of the most dangerous favelas in Brazil." "True," I said, "but the local people appreciate our efforts, so it's not so bad." "You know," he said, "our organization likes to assist any school that is successful in helping the poor and destitute. On our recommendation the Brazilian government often gives grants to such schools. Perhaps we could arrange a grant for your school?" "That would be wonderful," I said. "Here's my card. Please contact me, and we can discuss further how we can work together." "It's funny," he said. "I stopped you for a small donation but ended up offering to help get a big one for you." "Brazil is full of surprises," I said, shaking his hand. We arrived at the small rainforest. "Trianon Park was established in 1792" said the sign at the entrance. The noise of the city faded behind us as we strolled along the ferns, bushes, and flowering foliage. I was mesmerized by the charm of the park, almost as if I had been taken back to Satya-yuga. Huge trees - some well over four hundred years old according to signs along the pathway - rose high into the sky. Groups of little monkeys scampered above on the forest canopy while parrots and other colorful birds called out and darted among the trees. "Imagine what it was like in ancient times," I said, "when this environment extended for thousands of miles. It reminds me of the proverb 'God created the country and man created the city.' Let's sit here for a while and just chant on our beads." I turned my attention to the chanting of the holy names. In the sublime atmosphere my fatigue and exhaustion gradually disappeared, and I felt refreshed and energized. After about an hour of chanting, Bhakta John and I ventured a little further into the rainforest. "Parks like this were an important part of Vedic urban planning," I said. I searched my Pocket Vedas application on my iPhone for a reference in Srimad Bhagavatam and read aloud the verse I found. "The city of Dvarakapuri was filled with the opulences of all seasons. There were hermitages, orchards, flower gardens, parks and reservoirs of water breeding lotus flowers all over." "There's something magical about this place," I said. "Sao Paulo is our hub for the next six weeks, so whenever we return here from one of our other festival sites I'd like to come here again." "And I'd like to bring you here again," said Bhakta John. When we left the sanctuary of the forest, I felt as if I had re-entered the modern world, and sure enough my cell phone rang. It was Nandini dasi. "Gurudeva," she said, "I'm reminding you that the group has two newspaper interviews and a television program this afternoon." I turned to Bhakta John. "We have to hurry back," I said. We made it to the television studio for our talk show with just a few minutes to spare. We chatted a bit with our host before the show started. "Tell me," she said, "what attracted you to come to Brazil a third time?" I thought for a moment. "The people," I finally said. "As far as I've seen, the people in Brazil show an interest in Krsna consciousness that I've not seen anywhere else in the world." "I see you've got quite an intense schedule ahead of you," she said. "You'll be visiting most of our major cities. Brazil is a big country. Are you sure you can handle it?" "Well," I said, "I'm in my sixties, but I can handle it if I get a break from time to time." She smiled. "Brazil is full of beautiful places," she said. "Where are you thinking of taking your breaks?" "In Trianon Park," I said. "Trianon Park?" she said. "Our little downtown rainforest?" "Yes," I said. "It's a fascinating place. I feel completely refreshed after my visit there this afternoon. I plan to go back as often as I can. Establishing that park was a brilliant idea on the part of the city founders." "Perfection of human civilization is made possible by utilizing the gifts of nature in their own way. As we find herewith in the description of its opulence, Dvaraka was surrounded by flower gardens and fruit orchards along with reservoirs of water and growing lotuses... It is understood that the whole dhama, or residential quarter, was surrounded by such gardens and parks with reservoirs of water where lotuses grew... Human energy should be properly utilized in developing the finer senses for spiritual understanding, in which lies the solution of life. Fruits, flowers, beautiful gardens, parks and reservoirs of water with ducks and swans playing in the midst of lotus flowers, and cows giving sufficient milk and butter are essential for developing the finer tissues of the human body... The description of Dvaraka-dhama is the ideal of human civilization."